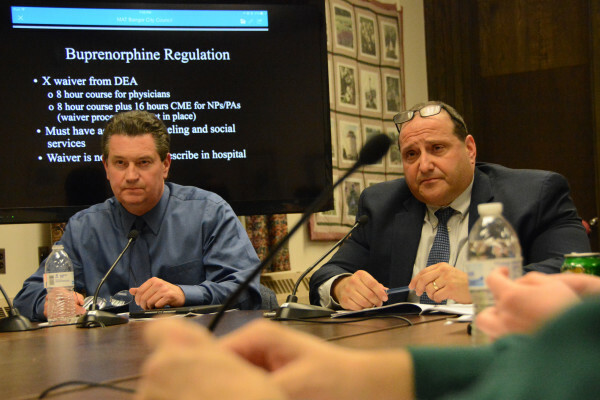 Bangor City Council members David Nealley (left) and Chairman Joe Baldacci can be seen in this November 2016 file photo. BANGOR, Maine — The City Council will mail a letter to the state’s federal government representatives opposing repealing Obamacare, Chairman Joe Baldacci said Tuesday. Weston described the letter as well-meaning but inappropriate for the council and burdensome work for government staff. “We’ve had resolves against war, against Citizens United, against Supreme Court cases, we’ve told other communities what they are supposed to do do. These are useless exercises,” Weston said during the workshop. A draft of Heitmann’s letter, which is expected to be refined, cites how the act, since it was passed in 2010, has reduced the number of uninsured from 41 million to 29 million people nationwide. Under the act, 588,000 Mainers are eligible for preventative care without cost-sharing, while 8,000 others get coverage until age 26. More than 273,000 Mainers on Medicaid or the Children’s Health Insurance Program also benefit from the program, Heitmann wrote. The Heritage Foundation, a conservative think tank based in Washington, D.C., said in November 2016 that the care act’s flaws include an expected 25 percent increase in health care costs in 2017, an overly complex system of excessive insurance subsidies, health benefit mandates and rating rules that greatly increase health insurance costs, and a flawed arrangement for protecting people from coverage exclusions for pre-existing medical conditions. Correction: An earlier version of this report misspelled Cary Weston’s name.